The average tenure of our Sales Consultants and Service Technicians is over 8 and 5 years, respectively. We do not tolerate any form of deception or misrepresentation. Period. 9 languages are spoken in our showroom. Choose the one with which you are most comfortable. Thorough and clear explanations of everything and anything. Please, just ask. Thanks for considering Helms Bros. We look forward to working with you. WHY CHOOSE HELMS BROS., INC? 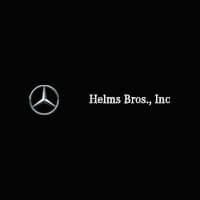 Thank You For Choosing Helms Bros., Inc.